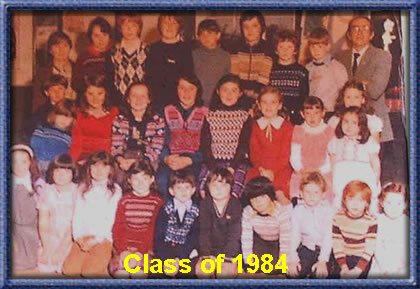 The teachers in the Photo are Mr Dónal O’Connor Snr and Mrs Eileen O’Connor. If you can name some or all of the children, please email us the details. The school was originally built in 1862 , the earliest Roll books dating back to 1876, more than 140 years ago. At that time there were two separate schools in the same building, known as Ballyseede Boys and Ballyseede Girls primary schools and they were located at Liosardbuala, close to where John Hoffman’s house stands today. In the early years, James Hayes was principal of the Boys school and Mrs Hayes was principal of the girls school. She was succeeded by Miss Minnie Hayes in the late eighteen hundreds. The school relocated again in the early years of the last century to a site closer to where it stands at present. It was built on a small site in Poulamhadra where the Late Billy and Violet Masons house was subsequently constructed. Up to this time the school was run by the parish of BallyMacElligott. In 1929 the boys and girls schools were amalgamated. Some teachers in the school around that time were Miss O Hara, Miss Teahan and Mrs Fleming. Other teachers who worked there over the years were, Mr Edgeworth, Jeremiah O Connor, David Sweeney. However, in 1933 an new three roomed school was built on the present site in Caherleaheen by the Dean of St John’s in Tralee -for the princely sum of £400 and this is where the school is to be found today. The late Jerry Sugrue recounted some years ago that the red sandstone for the building was cut by hand from a quarry in Foleys’Glen and transported by horse and cart. Local masons then cut, dressed and pointed the stone on site and the entire operation took four years. Tom Mason from Caherleaheen recalls that problems arose on the building of the perimeter boundary wall and as a result enough stone was not available to finish the job. Consquently, only three boundaries were completed and a rough ditch had to be constructed for the eastern perimeter. At that time also, there was still in effect two separate schools in one building-one for the boys and one for the girls. There were separate toilets, cloakrooms, classrooms and playgrounds-keeping in line with the thinking of the time. All children had to pay an annual fee and each family had to contribute to the heating of the school by bringing a bundle of turf or bag of coal every Monday morning. The present school was completed in 1998 and what we have today is a very far cry from what our parents and grandparents were accustomed to. For more local history click here.